Prize winners at the Cops & Bobbers fishing tournament. There were plenty of fish stories to tell last Saturday, June 11, about the ones successfully landed as well as those that got away. Nearly 100 youngsters took to the banks of Stevenson’s Lake, southwest of Petersburg, to try their luck in the first annual Cops & Bobbers Fishing Tournament. 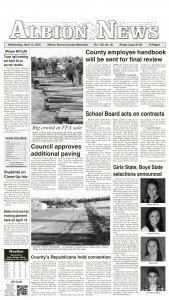 The kids, most with assistance from the adults, hauled out several varieties of fish during 1 1/2-hour tournament. Most caught bluegill, but there were also several bass, crappie and catfish weighed. The first fish of the day was landed by Dominic Graves, age six, who brought in his first bluegirl within the first minute of the tournament. 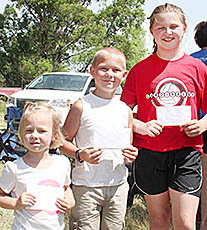 Age group winners of the top prizes for largest fish of the contest were Camryn Martin in the one to five-year-old age group; Gavin Mock in the six to 10-year-old group, and Caydence Guthard in the 11 to 15 group. Caleb Branham, 15, received the top prize for the most unusual catch, hauling in a beer can and a bed spring on two separate casts. 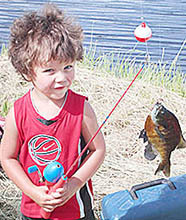 Trytten Friese, age 3, was happy after catching his fifth fish of the day.